. "Joseph-Armand Bombardier". The Canadian Encyclopedia, 16 April 2019, Historica Canada. https://www.thecanadianencyclopedia.ca/en/article/joseph-armand-bombardier. Accessed 23 April 2019. Joseph-Armand Bombardier was the inventor of the snowmobile (artwork by Irma Coucill). First snowmobile (courtesy Bombardier Inc). Joseph-Armand Bombardier was born in Valcourt, Québec — a small farming village in the Eastern Townships. The eldest of eight siblings, Bombardier discovered an ease for mechanics at an early age. At 13 years old, he built a miniature locomotive that was propelled by clock mechanisms he bought from a local jeweller. This was followed by toy tractors and boats he built for his younger siblings. He also connected an aunt's spinning wheel to a small steam engine and converted a rusty rifle into a miniature cannon. On New Year’s Eve 1922, when he was 15 years old, Bombardier tested his first full-scale invention. He strapped a Model T Ford engine he had refurbished to the top of two wooden sleds hitched in tandem. The engine drove a hand-made wooden propeller, which thrust the vehicle through the snow. Though it ran for over a kilometre, his father ordered the machine dismantled because its open propeller could cause considerable injury. At 17, after years spent attending a seminary school at the behest of his father, Bombardier became an apprentice mechanic in a local garage and later moved to Montréal, where he studied electrical and mechanical engineering. Two years later, his father built him a workshop in Valcourt from which he serviced all manner of machinery, from motorized saws to grain threshers, cars and water pumps. (To meet his shop’s electrical needs, he built a dam on a nearby watercourse and installed a mini-turbine.) Meanwhile, Bombardier worked on a light-weight winter vehicle that was easy to manoeuvre in all snow conditions. In 1929, he married Yvonne Labrecque, and together they had six children. Sadly, in January 1934, their two-year-old son died of peritonitis because the family could not reach the hospital in time — a development which, to Bombardier, underscored the need for effective winter transportation in rural communities such as Valcourt. In 1935, Bombardier assembled a vehicle that ran on caterpillar tracks similar to a tank’s. The first snowmobile, the vehicle was steered by skis and could hold two or three passengers. With his first patented mechanical system — the snowmobile’s sprocket wheel and track drive system, patented 29 June 1937 — Bombardier brought his seven-seat B7 snowmobile to the market in 1937. The first buyers (about 100 in 1939) were country doctors, ambulance drivers and priests living in remote areas. The market soon expanded to retail businesses, transport companies, electrical utilities, telephone companies, mail carriers and forestry operations. Bombardier gradually converted his garage into a manufacturing company called L’Auto-Neige Bombardier Limitée, hiring farm labourers from Valcourt and training them as specialized workers. Bombardier’s brothers and cousins held leading positions in management, sales and technical research. It was not long before a new factory was acquired and 200 snowmobiles built each year. 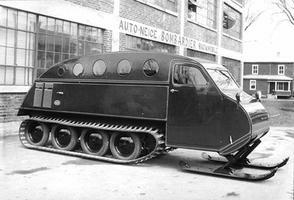 After the start of the Second World War, the Canadian Armed Forces showed interest in Bombardier's B12 snowmobile (patented in 1942), but wanted a more powerful model that could move troops and military equipment in winter. This led him to develop four different models of large armoured tracked vehicles, 1,900 of which were manufactured between 1942 and 1946. In 1947, L’Auto-Neige Bombardier produced 1,000 vehicles, including the C18, which was designed as a winter school bus. These vehicles were used across Québec, but also in Ontario and Western Canada. However, the winter of 1947–48 brought setbacks. A lack of snow caused sales to plummet, and worse for Bombardier, governments had begun to clear snow from country roads, which rendered the snowmobile obsolete. In response, Bombardier began designing all-terrain vehicles, which became instrumental in the agriculture, mining, petroleum and forestry industries. One of Bombardier’s successes of this period was the Muskeg tractor. Introduced in 1953, the Muskeg ("grassy bog" in Algonquian) was an all-terrain model equally suited to traversing swamp, sand or snow. The worldwide success of the Muskeg allowed Bombardier to return to an old dream: a smaller, ultra-light model of the snowmobile. In 1958, he tested the first wooden prototype. In 1959, he personally delivered the first Ski-Doo to a missionary in remote northern Ontario. The Ski-Doo was small — comparable to a motorcycle — and propelled by a single track that was as wide as the machine and set behind steerable skis. Within a decade, it significantly impacted life in northern and Arctic communities. Its recreational use ensured the company's prosperity long after Bombardier's death on 18 February 1964. In the early 1970s, when competing snowmobile producers threatened to overwhelm Bombardier Inc., and a global oil crisis loomed, the company survived by expanding into new markets, including locomotive and light rail transport. In 1974, the company won the contract to manufacture subway cars for the Montreal Metro, and two years later it purchased a majority stake in MLW-Worthington Ltd., a locomotive manufacturer in Montréal. In 1982, it landed the prestigious New York City subway contract. Years later, Bombardier entered the aeronautic industry when it purchased Canadair, manufacturer of the Challenger. (See Aerospace Industry.) In 1990, Bombardier acquired the Learjet Corporation, a company that builds business jets. In 1989, Bombardier (along with a consortium of other corporations) won the contract to build the trains for the "Chunnel” connecting France and the UK. From its head office in Montréal, Bombardier Inc. manages a close-knit network of subsidiaries, which hold operations in more than 60 countries. Joseph-Armand Bombardier built one of Canada's most storied companies and created one of its most famous brands. His success flowed from his ability not only to respond to changing transportation needs, but to create them — an inventiveness that gave rise to Bombardier Inc.’s record of shrewd business and innovation. See also Bombardier’s Success Story.